Bird, Nora and Crumpton, Michael, editors. 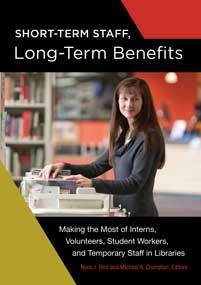 Short-Term Staff, Long-Term Benefits: Making the Most of Interns, Volunteers, Student Workers, and Temporary Staff in Libraries. Libraries Unlimited, 2018. ABC-CLIO, publisher.abc-clio.com/9781440841774. This book offers a novel, more efficient, and mutually beneficial approach to attracting, training, and working with short-term staff in ways that benefit all involved: the organization, the short-term staff, and library personnel in general.